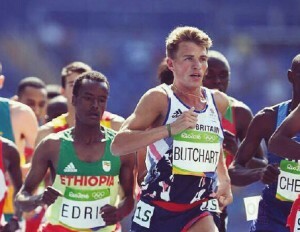 Team BB member, Olympian and former member of the 25th Stirling Company, Andrew Butchart, achieved a great deal in The Boys’ Brigade – not least achieving the Queen’s Badge and clinching the Scottish Cross-Country title. Andrew has gone on to accomplish a great deal in the athletics world – taking first place at the British championships and is currently the Scottish record holder at 5,000m. At Rio 2016, Andrew qualified for the 5,000m final and finished in an incredible sixth position – only missing out on the medals by a matter of seconds. Just days before setting off for Brazil, Andrew, sat down in conversation with BB young people attending KGVI at Carronvale House. Probably since about 17 when I started running with the BB and at school. That seems quite late – especially for someone who’s now an Olympic athlete? Well, I guess that like most guys you want to play football your whole life. You play for the local team and it just so happens I found running. What kind of preparations do you need to put in ahead of competing at the Olympics? Most of the year I spend at altitude either in America or in Europe, spending one or two months at a time there. Running at high altitudes of 2000m with much less oxygen can be pretty tough! So, what’s your training schedule been like? Each week I run around 100 miles. In the mornings I run around 10, before going on to the gym in the afternoon and then a six mile run in the evenings. Who would you say is your toughest competitor? It has to be Mo Farrah. He’s world class. I train with him sometimes… he’s a different level! Do you take part in any other sports? I try to get involved in as many sports as I can. But with the caution of being injured I have to be really careful… As long as it’s just recreational, I like to play some golf and some football when I can. What are your own BB memories? The things I remember most were the summer camps! I also really enjoyed teaching the younger kids. Towards the end of my time as a member I got to help the younger kids. It was great to see them grow through the BB and I still get a chance to see them around town now – they’re great guys! Would you say that there are particular aspects to your BB experience that have been helpful in your current athletics career? I think being part of the ‘BB family’ is quite similar to the athletics world. It’s similar in sense that everyone gets along, there’s good banter and camaraderie. You’ve come right the way through the organisation. Are there particular aspects which have made a positive difference on, or off the track? Definitely! When I was working towards the Queen’s Badge - doing voluntary service and helping out in the church – it made me come on to become a better person. Helping people is definitely something to do in life.